bl.uk > Online Gallery Home	> Online exhibitions	> Asia, Pacific and Africa Collections	> Christchurch, Kurrachee [Karachi]. 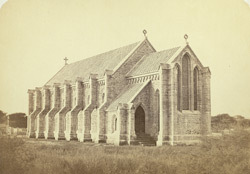 Photograph of the exterior of Christchurch in Karachi from the 'Album of architectural and topographical views, mostly in India' by an unknown photographer in the 1870s. Christchurch, which is also known as the Church mission Society Church, dates from c.1856. The patron of the church was Henry Preedy, the Bazaar Master and first Collector of Karachi. The Church is situated in the same compound as the Church Mission School founded in 1846 and the Kutchery, a meeting place, built in 1855. This compound was passed onto the Church Mission Society in 1853.